Butter and flour the bottom and sides of a 9 inch springform pan. Preheat oven @ 350 degrees. Sift together the all-purpose flour, baking powder, and salt and set aside. In the mixer, cream the butter and sugar on medium-high speed until light and fluffy, about 2 minutes. Add the eggs, one at a time, mixing each in thoroughly. 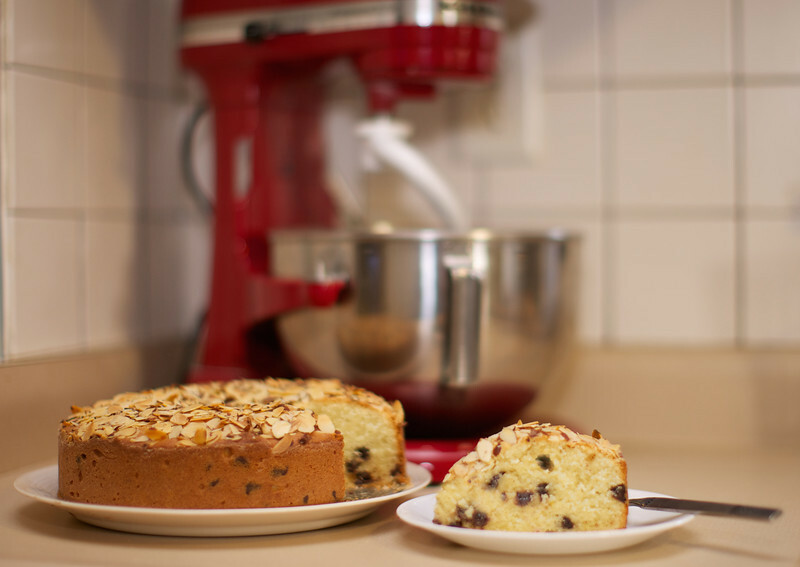 Beat in the lemon zest and almond extract, then raise the speed to high and beat the batter until very light. On low speed, mix in half of the sifted flour mixture, beating just until it is incorporated; beat in half the almond flour. Scrape the bowl, and mix in the remaining all-purpose flour and remaining almond flour. Beat briefly on medium to a smooth batter. Fold the chocolate chips in just until evenly distributed. Pour the batter into the prepared pan, and spread it in an even layer. Scatter the sliced almonds all over the top. Bake the torta for 1 hour or until toothpick inserted comes out dry. Cool the cake completely before serving. Cut it in wedges, and dust with confectioners sugar, a dab of whipped cream or ice cream. Yum! 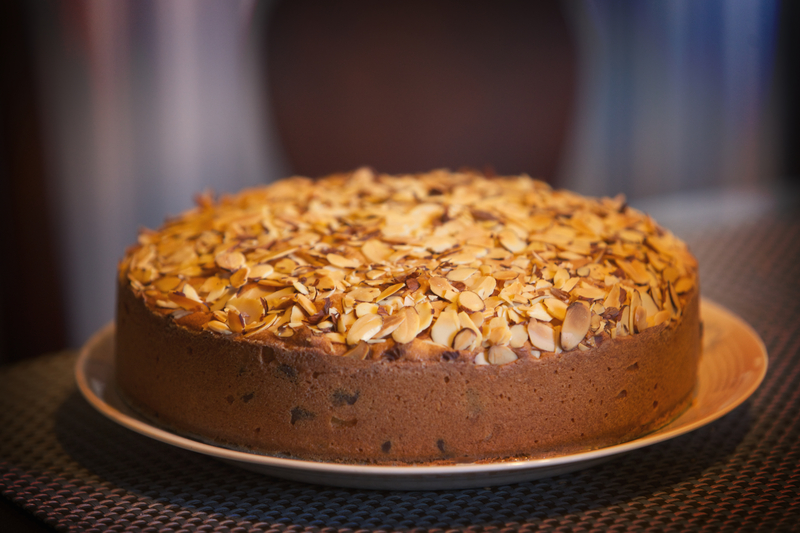 This entry was posted in Uncategorized and tagged almond cake, cake. Bookmark the permalink. Put on the coffee, I am on my way over. That looks so good. Carol–I’m Angies Friend. Made this cake you said to bake for 60 minutes but my oven at 45 minutes it was slightly over done I made notes on my recipe to check at 30 minutes. but it did taste great. Angie stopped by to taste it. Glad you liked it Sandy. Wow, that’s a big difference in temp time. All ovens are so different. Did you use a 9 inch springform pan? Mine could have been in for a bit more than 60 mins.